RE: How to build for Windows Phone 10 ? Does anyone have any information or tutorial about in-app purchase function: with or without plugin wich is provided by monaca (but i can’t found it in plug list…) ? 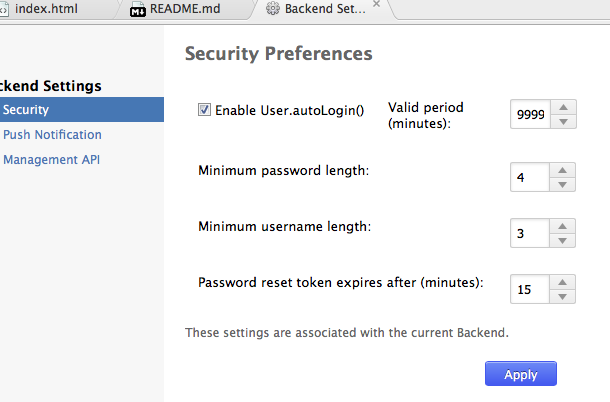 About autologin time limit, my question was about the parameter that we can adjust in monaca backend settings. Could we have an unlimited valid period ? About second question, it was more about monaca backend global settings, rather than my own development : does monaca team limit number of device per user or something like that. We use Monaca to develop an hybrid app. We use Monaca Backend services to authenticate user. Is there anyway to have no time limit for auto-login ? In our case, we also have a web portal to modify user’s password (if mobile is stolen for example) so unlimited time for auto login could be a great function. Or maybe can we have more “minutes” to add ? Another question is about number of current “active” login for a user : is there any limit (no more than 5 devices for example) ? Could we use login on a device and then connect with another and keep firt connection open ?